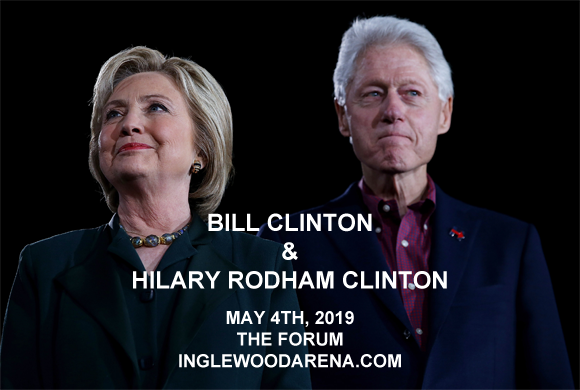 One of the world's most famous couples, President Bill Clinton and former Secretary of State Hillary Clinton will be visiting The Forum on Saturday 4th May 2019! The Clintons will be sharing “stories and inspiring anecdotes that shaped their historic careers in public service, while also discussing issues of the day and looking toward the future,” in an intimate event that gives an insight into the lives of two powerful and notable figures of American politics! Tickets available now! Bill Clinton is the 42nd President of the United States, serving from January 20, 1993, to January 20, 2001. Clinton attended Georgetown University, University College, Oxford, and Yale Law School before becoming the Governor of Arkansas, his hometown, from 1979 to 1981, and again from 1983 to 1992. Clinton met future wife Hillary Rodham, at Yale, marrying her in 1975. He was elected in 1992, and became the third-youngest president and the first from the Baby Boomer generation. In 2001, he left office with the highest end-of-office approval rating of any U.S. president since World War II. American politician and diplomat Hillary Rodham Clinton served as the First Lady of the United States from 1993 to 2001, U.S. Senator from New York from 2001 to 2009, 67th United States Secretary of State from 2009 to 2013, and as the Democratic Party's nominee for President of the United States in the 2016 election. Clinton graduated from Wellesley College in 1969 and earned a Juris Doctor from Yale Law School in 1973. In addition to her political work, Clinton is a best-selling author whose audio recording of her book It Takes a Village: And Other Lessons Children Teach Us won her the Grammy Award for Best Spoken Word Album in 1997.